Having looked at several older figures and sets from Ultracast, I though I’d get up to date and have a look at their two most recent releases, kit numbers 35050 and 35049 Canadian/British Tank Crewmen All Theatres – Summer 1939-45. I picked these two up at The Milton Keynes Model Show, so got them a little cheaper than the current rate. I decided to review both figures together as they are very similar in dress and stature. Both of these figures were sculpted by Alan Ball. Both come packed in the usual Ultracast way, the parts of the figures being contained in a zip plastic bag attached to a backing card showing a colour picture of the figure to aid painting. On the reverse of the card there are some basic instructions, along with a Health and Safety warning about working with resin. They are cast in a light cream resin, the detail is crisp and clear and although the pour block looks big, little clean up should be necessary other than removing some flash. Sculpting is excellent. This single figure depicts a British or Commonwealth Tank Crewman in a standing position about to light a cigarette. The figure comes in 4 simple parts, the body, a separate head and the arms. What is unusual, or not so often depicted, is that he is shown without his Battle Dress jacket. He is wearing Battle dress trousers, these have the correct pockets and nice detail on the belt loops. His upper body is shown wearing a Canadian ORs shirt. These differed from the standard British shirts and had buttons all the way down the front, so if you want a British Soldier you will have to remove a button and smooth the shirt join at the bottom. His ID tag appears to be hanging outside the shirt. On top of his shirt are a nice pair of braces and on his feet a pair of ammo boots both of which have good detail. The figure is shown wearing anklets and again the detail on these is excellent. His right and left arms have rolled up shirt sleeves and are bent at the elbow in the act of lighting a cigarette. In his left hand he has what looks like a Zippo lighter but you will need to add a cigarette. The head is excellent and shows the face of a pretty tough looking young man. The detail is very crisp and on his head he is wearing a tankers beret complete with badge. Again, this is a single figure which comes in 4 parts, which shows a Canadian or British Tanker in a relaxed order of dress. Clothing is similar to figure 35050 so I shall not repeat what I have already said. The only difference in dress is that this time the figures braces are shown hanging loose across the hips, a small but important piece of variation. The stance is that of a man standing with his hands resting on his hips. Again, the shirt sleeves are rolled up to the elbow with his hand resting on his hips, and overall a very natural pose. The head is excellent, a good natural face with the beret shown worn slightly back on the head exposing a fine crop of hair. 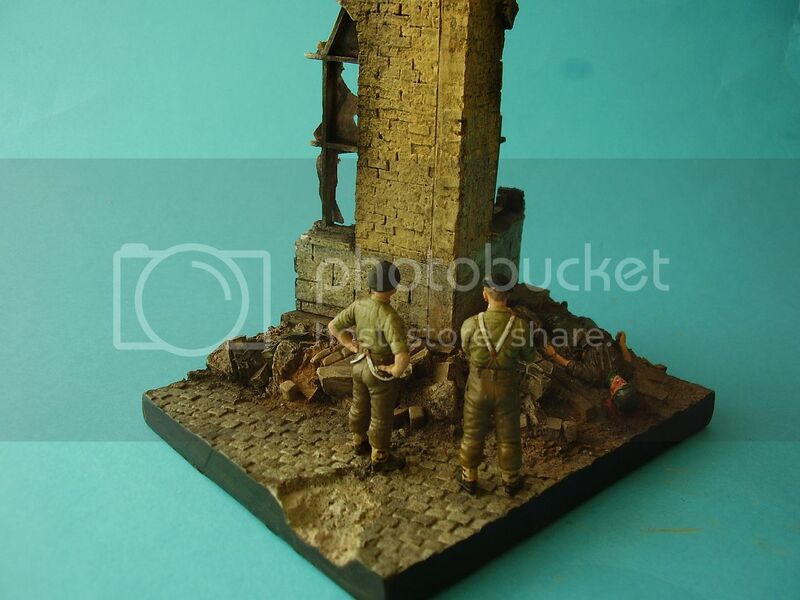 Two excellent and very detailed figures. The sculpting is first rate. The poses are simple and natural. The relaxed order of dress is very appropriate for soldiers taking a NAAFI break, or short rest break whilst working. First-class casting and superb detail should mean that these two paint up very nicely indeed. They should be useable in many theatres of war and only a slight alteration would be needed to make the shirts into the British style. A change of head and you’ve got yourself a couple of infantrymen too. Highs: Excellent sculpting and casting, giving very good detail indeed. Both poses are natural and the faces excellent. 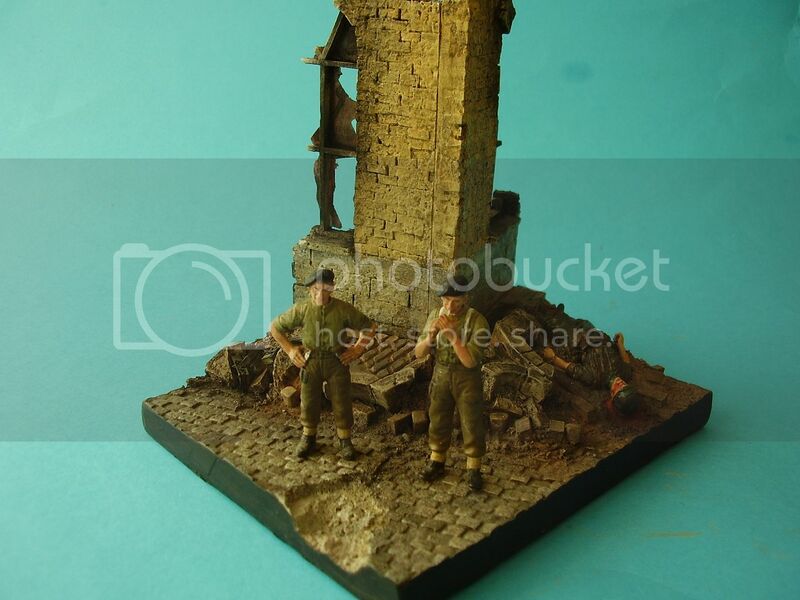 Modellers and figure painters alike will find many uses for these two very generic and useable figures. Lows: Only the exchange rate, Ultracast figures don’t come cheap. The extra shirt button will only need to be removed if you want a British soldier but, don’t forget soldiers do ‘trade’! Hey Al, Dad mentioned that BD jackets were also modified with a removable collar liner that could be removed and washed without doing the whole jacket He also recalled that the early BD's were permeated with a foul smelling anti-gas chemical that just reeked and only got worse when the uniform got wet. I'm still trying to find those books on the Canadian uniforms. Cheers jjumbo [/quote] Mine just stink of Mothballs!